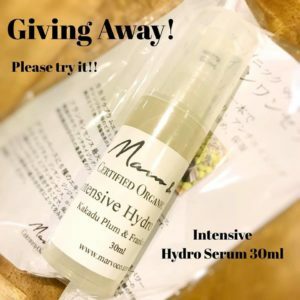 Register at https://marvoco.com/my-account/# to join Marvo&Co Loyalty Rewards Program between 17th April and 30th April, and receive 99.6% Organic, All-In-One Serum 30g! You will also receive $5 for your next online shopping with Marvo&Co! After registering, just email your name and address to info@marvoco.com (only available within Australia). We will be sending out the Hydro Serum 30g starting from 1st of May. With Kakadu plum full of Vitamin C and Polyphenol, Anti-aging Frankincense, and pore cleansing and pore tightening Aloe Vera Gel, this miracle blend serum will take care of all your skincare needs!